It’s all about setting the right tone. But how? This is the question also posed by top musicians, professors and young soloists at the “Kronberg Academy”. G. Henle Publishers is using the 20th anniversary of this internationally renowned educational institution for string players as an opportunity to support it with its music editions and know-how. All of our blue Urtext editions for strings are now stocked in the Kronberg Academy library and can be used for making music. G. Henle Publishers has donated these editions – worth 6,500 euros – to the Academy. New editions will be sent on every year. 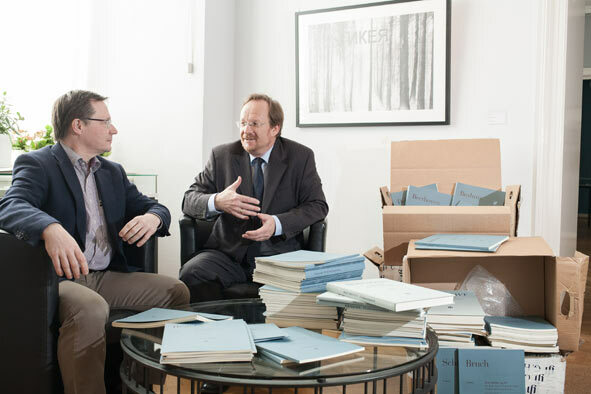 Dr. Wolf-Dieter Seiffert, CEO of G. Henle Publishers, has justified this donation – the publishing house’s largest donation of music in years – on account of the excellent achievements and the special atmosphere at the Kronberg institution. “The Kronberg Academy is not only unique as far as the level of the teachers, students and those responsible is concerned. There’s simply a very special, friendly and supportive atmosphere.” The CEO and artistic director of the Kronberg Academy, Raimund Trenkler, also sees the cooperation as a partnership between kindred spirits.